I am slightly obsessed with lobster rolls. Having never had the pleasure of actually eating one of these delicacies that I imagine are abundantly available as soon as you step off the plane in someplace like Boston or anywhere in Maine, they are starting to reach mythical existence in my mind. Every-now-and-then the craving gets bad enough that I have to make something that I imagine to be similar, almost immediately. This orzo salad was the result of one such craving. 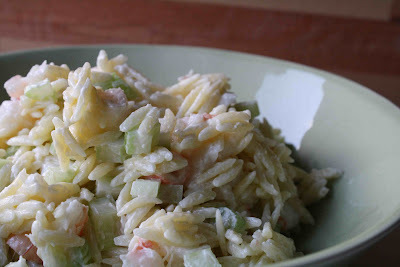 I added shrimp and crisp celery to some cooked orzo and dressed the whole thing with a mayonnaise horseradish mixture. It absolutely hit the spot. Possibly more so than anything I've made to try and quell these cravings in the past. One day, I will eat a lobster roll on the East Coast. Until then, this salad will certainly suffice. Boil water, add the orzo and cook for 9 minutes. Add the shrimp to the water and cook until pink. Drain the pasta and shrimp and set aside. When the shrimp is cool enough to handle, chop. Mix the mayonnaise, sour cream, horseradish and salt together and add the dressing to the pasta along with the chopped shrimp and celery. Stir to combine and add more salt to taste. Enjoy! Yup, it's like a lei in Hawaii, as soon as you step off the plane on the East Coast, they put a lobster roll in your hand ;-) Ok, no, I won't say anything about how delicious fresh lobster is to make you jealous, that would be mean. Your dish looks yummy! I've yet to see a lobster roll in my area of the east coast. In fact seafood here is so overpriced that we don't eat it very often. That's my own fault because I'll only buy from the fishmonger and not the grocery stores. I am ashamed to say I visited the east coast and never had a lobster roll...guess I will have to return. The shrimp dish looks lovely. Another delicious one to add to my list of things to try! Your shrimp salad would make a lovely lunch. It looks delicious. Great looking salad. I love shrimp! ooh, i'm trying to get myself to like shrimp, and this combo is calling my name!! Yes! I use to live in New England (grew up there) and lobster is everywhere and sooo cheap! McDonalds even has lobster rolls that are eatable! I absolutely love orzo and anything with shrimp in it has my vote. This looks fabulous and I love how you photographed this. I have had the same fantasy about lobster rolls - and when my mum went to Boston a couple of years ago for a conference she almost ate herself sick she said they were so good! I think your salad looks delicious - the horseradish would give it just the right bite. The lobster rolls here in RI are amazing!